Over Labor Day weekend, a group of teenagers visited Eagle Creek Trail, a hiking destination near Portland, Oregon, known for dramatic waterfalls, sheer cliffs and exuberant plant life. While another young man filmed, a 15-year-old boy from Vancouver, Washington, lit firecrackers and tossed them into Eagle Creek Canyon, setting alight one of Oregon’s most beloved and frequently-visited places, the Columbia River Gorge National Scenic Area. At publication, the wildfire started by negligence is some 33,000 acres and just 7 percent contained. On Monday night, the fire jumped the Columbia River Gorge – which at that location is approximately a mile wide – and sparked the smaller Archer Mountain fire in Washington state. While it’s not Oregon’s largest wildfire at the moment – the 177,000-acre Chetco Bar Fire is – the Eagle Creek Fire stands out because it’s so close to a major urban area. What’s more, the gorge is a treasured place. “It’s where people have their first hikes, where they propose. They have their last memories there too,” says Michael Lang, conservation director at Friends of the Columbia Gorge. Though locally heartbreaking, this fits a pattern: Nationally, people ignite about 84 percent of wildfires. In the Pacific Northwest, human-caused wildfires cluster near the major metropolitan regions of Portland, Oregon, and Seattle, Washington. In short, people burn the places they love. The human-started Eagle Creek Fire burned more than 30,000 acres as of September 8. In the long term, Lang says, the “gorge is incredibly resilient.” But on a human timescale, some things are irreplaceable. 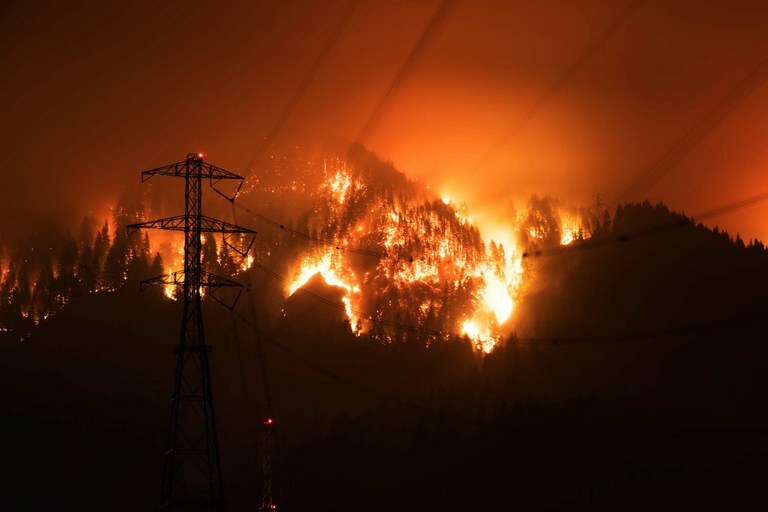 By Wednesday, the fire had already forced almost 2,000 residents from five communities on the Oregon side of the Columbia River Gorge to evacuate. “All of the structures are a top priority,” says Elisabeth Dare, a field ranger with the U.S. Forest Service based in the Columbia Gorge. Fire crews worked overnight to save the historic Multnomah Falls Lodge – the most popular tourist attraction in the scenic area – from what a daily fire report described as a “fire storm of falling embers.” At this point, it’s too early to know what damage may happen to other property or buildings. Steep terrain and thick smoke make the Eagle Creek Fire especially difficult to fight, Dare said, adding the fire will burn at least until the area gets “serious rain, and potentially past that.” The state of Oregon declared the fire a conflagration, freeing up more resources to fight the flames. Other consequences are still unfolding: As flames lick at the edges of the Bull Run watershed, the source of the region’s drinking water, both chemical fire retardants – which have been approved but not used – and the fire itself may pose unknown risks to the future of the region’s water source. The Eagle Creek Fire may also inhibit major transportation lines connecting West Coast seaports to the country’s interior, including barges, rail lines, and ground transportation. Interstate 84 remains partly closed. Earlier this week, according to Oregon Public Broadcasting, the Oregon Department of Fish and Wildlife released some 600,000 chinook salmon from their Bonneville Hatchery, after intake pipes became clogged with ash and the fish stopped receiving water. What the fire means for the area’s ecology in the long term is yet to be seen. Partly, that’s because the area’s ecology is so diverse. At its lowest, the burning section of the gorge is just 40 feet above sea level, while its walls stretch several thousand feet above sea level, Lang said. The life in the gorge also varies from its wetter western end to its drier eastern end.